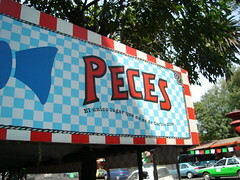 Peces, a seafood restaurant in Mexico City's Col. Roma, uses the slogan, "The only one that doesn't belong to Slim," a reference to the world's richest man, Carlos Slim. MEXICO CITY — News of Mexican billionaire Carlos Slim Helu topping the annual Forbes list of the world's wealthiest individuals came as little surprise to many in Mexico, including social-activist-turned-restaurateur Marco Rascon. Famed for previously masquerading as "Super Barrio" — a portly protest leader clad in wrestling tights and "lucha-libre" mask — Rascon has turned his mischievous instincts in recent years toward highlighting the enormous influence of the country's richest man on the national economy and his apparent ability to run roughshod over regulators. As an example, Rascon's seafood restaurant — Peces, or Fishes — goes by the slogan, "The only one that doesn't belong to Slim." Rascon has tried living beyond the reach of Slim's empire as much as possible by avoiding the billionaire's companies, which dominate the telecommunications sector and have a strong presence in retail, construction, tobacco and banking — among other industries. He's mostly failed in his attempts. "It's a fantasy," he said flatly of any attempt to avoid patronizing Slim's companies. "You almost can't breath in Mexico" without paying him something. Such is Slim's dominance of the Mexican economy, which long has been characterized by the enormous concentration of wealth, monopolies and limited competition in sectors such as telecommunications, broadcasting, cement and brewing, and perceptions the federal government and regulators are unable or unwilling to abate monopolistic business practices. Slim's dominance of the economy is so expansive that nearly anyone in Mexico making a cellphone call, surfing the Internet, smoking a Marlboro cigarette, sipping coffee in the ubiquitous Sanborns chain, shopping in his malls (anchored by Sears, which he owns in Mexico) or driving on the roads built by his construction company puts money in his pocket. It's estimated his companies at one point comprised roughly one-third of the Mexican stock exchange's value, while his telecommunications companies — fixed-line operator Telefonos de Mexico (Telmex) and cellular operator America Movil — have been accused of charging some of the highest rates in the industrialized world. Telmex and America Movil deny charging exorbitant rates, while Slim has denied being a monopolist and says on his personal website that Telemex has more than 600 competitors. Industry analysts credit Slim with transforming a monopoly with antiquated technology and a reputation for surly customer service into a world-class company. Read the rest of the story at the Ottawa Citizen website.